Bill Denholm’s career as a Metallurgical Engineer has encompassed research and teaching in Physical Metallurgy, Electrochemistry (Corrosion Science) and Extraction Metallurgy, at Melbourne University, South Australian Institute of Technology (SAIT, now the University of South Australia), Imperial College London and CSIRO, finally becoming a Chief Research Scientist in the Division of Mineral and Process Engineering. 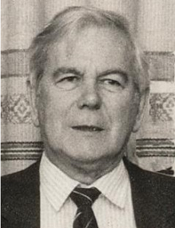 William Thomas Denholm was born in Bacchus Marsh, Victoria in 1925, and educated in a number of Primary Schools throughout Victoria and at Horsham High School. He graduated in Metallurgical Engineering from the University of Melbourne in 1946 and worked in industry before returning to Melbourne University to complete an MEngSc Degree. In 1950, he moved to Adelaide as Lecturer in Physical Metallurgy in the Department of Metallurgical and Chemical Engineering, jointly run at that time by the University of Adelaide and the South Australian Institute of Technology (SAIT), and later became Reader in Charge of Metallurgy at SAIT. His PhD was awarded by the University of Adelaide in 1960 for his research in Corrosion Science. In 1964, he joined the CSIRO Division of Mineral Chemistry. He became Leader of the Metallurgical Chemistry Section in 1969, and transferred to the then Division of Chemical Engineering in 1974 as Leader of the Pyrometallurgy Section where the research leading to the development of SiroSmelt was performed. From 1981 until his retirement in 1990 his duties included the direct control of the SiroSmelt research in the Division. His consuming activity since retirement is singing with the Victoria Welsh Male Voice Choir. Bill is a life member of Australasian Corrosion Association, and was Australasian President in 1964. He is a fellow of The Australasian Institute of Mining and Metallurgy and served on the Melbourne Branch Committee for the period 1973-82. He is a Member of the Minerals Metals and Materials Society (USA).